We kinda thought Panasonic’s DMP-UB900 would be the next Ultra HD Blu-ray player available in the US (the expensive player is already selling across the pond), but it appears Philips may be next in line with the launch of their first UHD BD player announced to ship in June. The player will be available in both Brushed Aluminum (BDP7501) and Piano Black (BDP7301) finishes for the same price of $399. As well as spinning 4k Ultra HD Blu-ray discs, the BDP7501 will display HDR content to 4k TVs that support the new color specification. And, with pre-installed Netflix and YouTube apps the player will stream video encoded in HEVC and VP9. Supported high quality audio formats include Dolby TrueHD and DTS-HD Master Audio. For connectivity, the Philips UHD BD player has an HDMI 2.0a port for 4k video with HDR, older HDMI 1.4a port, and discrete HDMI audio port. Internet can be connected via Wi-Fi 802.11ac or wired Ethernet, and other types of media can be viewed or played via a USB port. 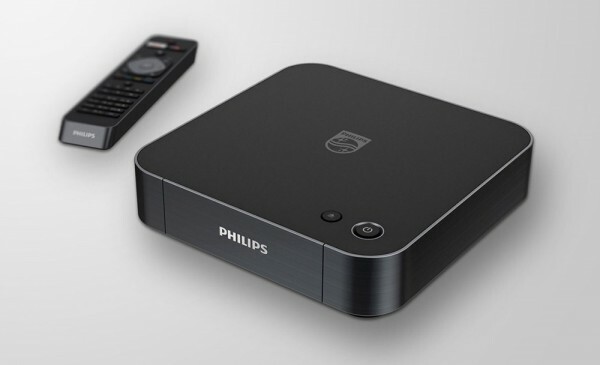 The Philips BDP7501, that looks more like the Roku 4 or Apple TV than a conventional disc player, is priced the same as the already available Samsung UBD-K8500. Previous Previous post: More Ultra HD Blu-ray Titles Coming from Warner Bros.